Custom crafted feather flags and banner flags. Made in the USA. High quality and long lasting. Design services offered for free. Custom Feather Banner Flags are the most common style of flags purchased by businesses for outdoor advertising. These flutter flags can be used indoors and outdoors. 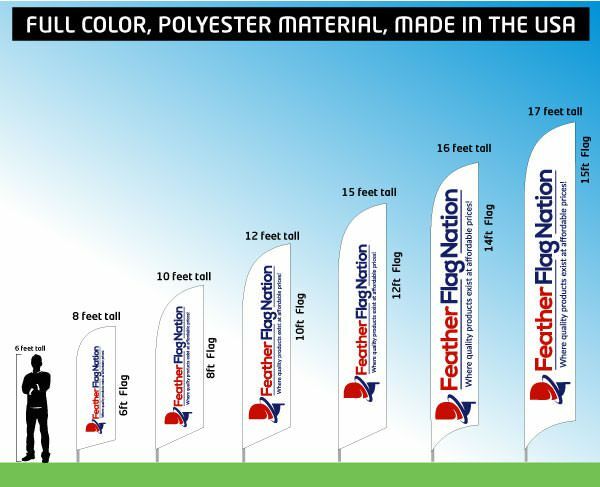 We offer custom feather flags in 6 different sizes sizes: 8ft, 10ft, 12ft, 15ft, 16ft, and 17ft. These custom fabric prints are available in single-sided reverse back or double-sided flag prints. Custom rectangle banner flags are 3ft wide and great for any in your face loud outdoor or indoor advertising. This style is loved by all of our clients! Custom Rectangle shaped banner flags are rising in popularity. These flags are great for indoor and outdoor advertising. We offer custom rectangle banner flags in 4 sizes: 8ft, 10ft, 12ft, and 15ft. Custom Rectangle flags can be purchased with a 2.5ft or a 3ft width and are available as single-sided reverse back or double-sided flag prints. Preferred by concert organizers. Custom blade flags have their own unique shape. Another option for client's looking for feather flag alternatives. These are great for indoors or outdoors. Custom Blade Feather Flags are great for businesses looking for cost effective advertising. These swooper style flags can be used indoors and outdoors. Custom blade banner flags come in 3 different sizes: 8ft, 12ft, and 15ft. These flags are available in single-sided reverse back or double-sided flag prints. Slightly different from standard feather banner flags. Custom air dancer puppets available by feather flag nation. Standard dancing man, Dancing puppet with arrow, and straight tube. Full color prints. Air dancers are tall, loud, and have lots of movement. They are perfect for attracting attention from everyone. Feather Flag Nation offers three styles of custom air dancer puppets: Air Dancing Puppets with waving arms and face, Air Dancing Puppets with Arrows, and Air Dancing Tubes. 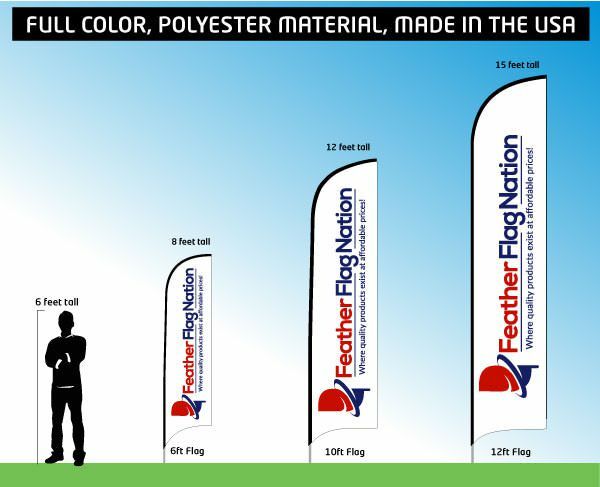 Custom teardrop flags are great for trade shows, car festivals, and indoor events. Typically used next to cars, tables, and desks. Great visually for all events. 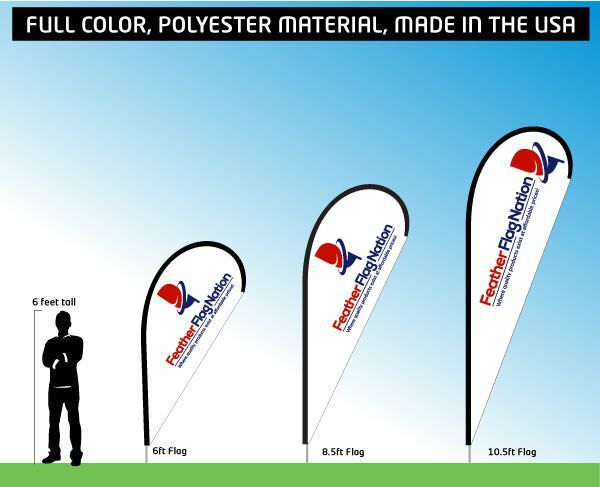 Custom Teardrop flags are great for all trade shows, conventions, and other events. These custom printed flags are used by corporations and businesses throughout the USA and Canada. With the unique paddle shape, the teardrop flags greatly adds visually to all events and locations. Custom vinyl banners are hemmed and grommets are punched every 2 feet. We specialize in large format printing. Prints available up to 10ft tall to 100ft wide. Custom printed vinyl banners pair well with custom feather flags or banner flags. Trade shows and indoor or outdoor events will always have a couple of vinyl banners to display on the side of their tents or tables. We can print banners are large as 10ft x 100ft. High quality polyester custom flags. Our standard sizes are 2×3′, 3×5′, 4×6′, and 5×8′. We also craft custom flags of various other sizes. Contact us and let us know about your project. Our professional design team will assist you in picking the best items for your purpose. All of our custom flags come finished with either hemming, sleeves, or grommets. Looking for weird shaped flags? Contact us, we can usually accommodate most unique requests. Use our online design tool and let your creativity loose to create your own unique custom flag. We provide free support, don’t be shy, contact us if you have any questions. Feather Flag Nation strives to provide high quality custom feather flags, banner flags, teardrop flags, vinyl banners, and air dancer inflatable tube men. We pride in producing our items within the United States of America.Our custom flutter or banner flags are all produced at our Riverside, CA or Atlanta, GA location. With American made goods, you can rest assured that you will be getting high quality custom flags and banner. With over a decade of experience in designing and producing custom flags and their hardware, we can promise you that you will get top of the quality flags, pole kits, and hardware. 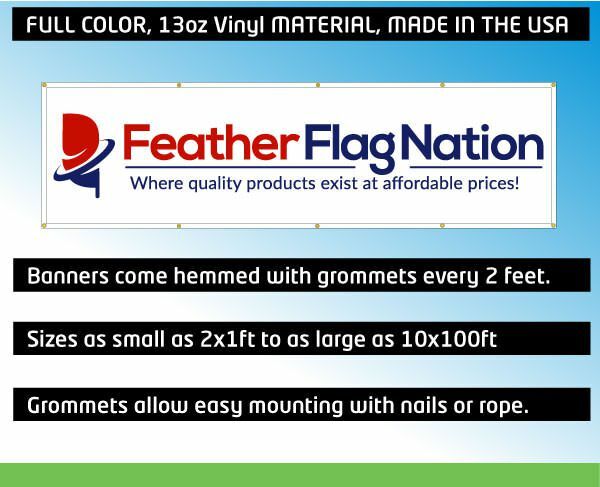 Additionally, since Feather Flag Nation is the direct source of these items, you will be getting the lowest prices possible. Our manufacturing plants cut, process, and create the majority of their custom pole kits. This allows us to have quality control and keep our defective products at under 0.1%. Our custom feather flutter flags swoop in the wind perfectly with our custom fitted hardware. With over a 300,000 square foot warehouse, we are able to stock items in bulk. Our large format custom vinyl prints are all printed, hemmed, and packaged in-house. To save you costs on shipping, we ship our items via UPS, USPS, and FedEx. With multiple carriers, we can choose the best shipping options for you custom products. Our custom crafted air dancers are not made of cheap quality nylon material. Nylon material rips very easily. Yes, they call it rip free, but when you grab a dancer with the air pressure from the air blower, the nylon dancer will rip! Our flexible fabric material lets you grab the custom air dancer puppet without any issues. Although we do not advise it, you can grab the air dancer, punch it, or hold on to it. The material will not break. 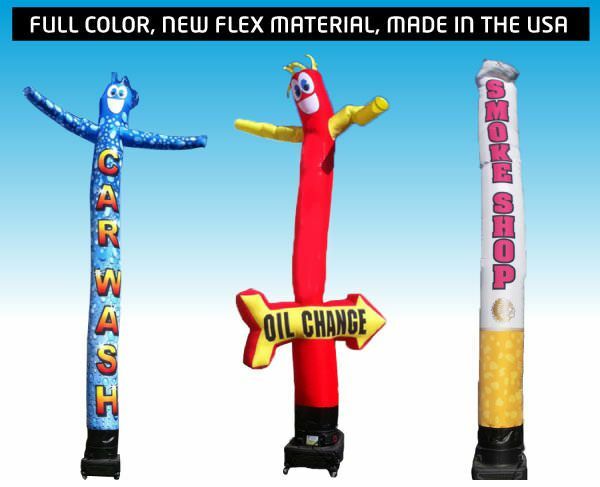 Our custom inflatable tube man are digitally printed, so you don’t need to worry about the number of letters or being limited on using any particular graphics or color. With our commercial digital print process, you can use live images, gradients, or anything else. Due to a digital print process, you can match our custom printed air dancer designs to your custom feather flags, teardrop flags, or rectangle flags. Our hardware for custom flags and flag banners is made of heavy duty aluminum. Our mounting hardware is made of strong metal and is always quality tested. We make sure our feather or banner flag’s pole kits ground spike, wheel bases, x-stands, and other mounting hardware have strong welding. We do not take short cuts on our hardware. Being in the industry, we’ve worked with many large corporations and small businesses. Due to our great customer service, quick turn around times, and high quality products, we have a very high retention rate. Almost all customers come back to make repeat purchases of custom feather banner flags or outdoor inflatable air dancers and tents.Our retention rate is nearly 100%! If you want your business, trade show booth, special event tent, or product to stand out from the thousands of other people, then purchasing a custom branded feather flag or banner flag is a must. All businesses must have outdoor advertising flags or banners to succeed. A business without a sign is a business bound for failure. Jump start your business campaign by purchasing some of our custom outdoor and indoor advertising feather flutter flags and custom outdoor air dancer puppets. For support, call us at 877-900-5692. Shy to speak to someone over the phone? 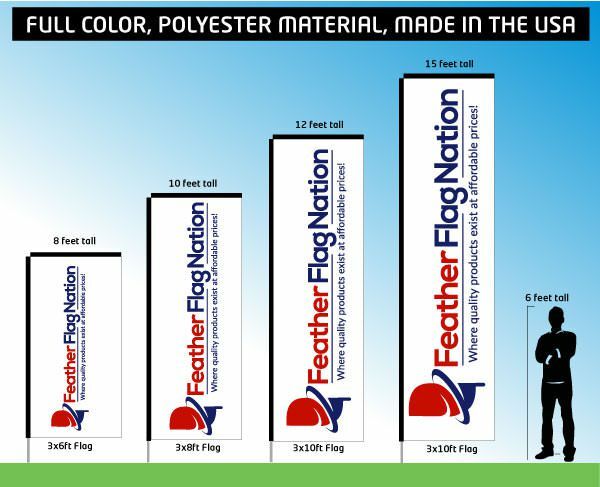 Email us at sales@featherflagnation.com. We can take care of your whole process from the custom design proof to finalizing your order via email. You do not need to pick-up a phone to get your order placed.